This week my inspiration comes from Holly of Down to Earth Style. 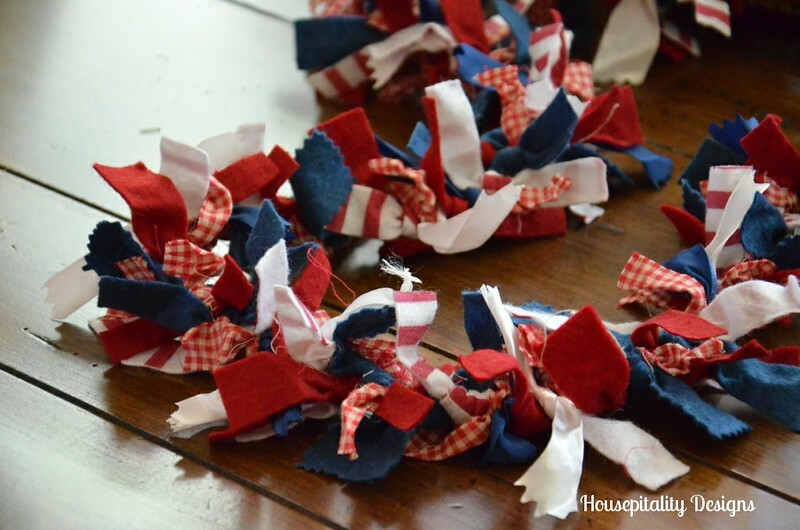 I did not make the entire wreath muslin…I added a muslin garland to my summer wreaths. …..I took the easy route! Look how gorgeous Holly’s wreath is!! I went to Michaels one day and saw these great garlands…so the “light” went on. I weaved the garland of fabric strips throughout my summer wreath. 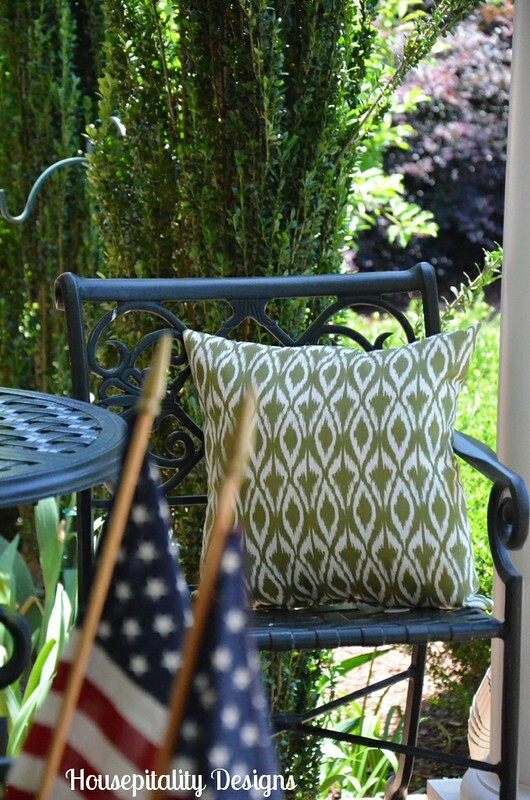 Years ago, I saw that Martha Stewart placed flags in her planters as I did…. ……I loved it and have been doing this for years now. 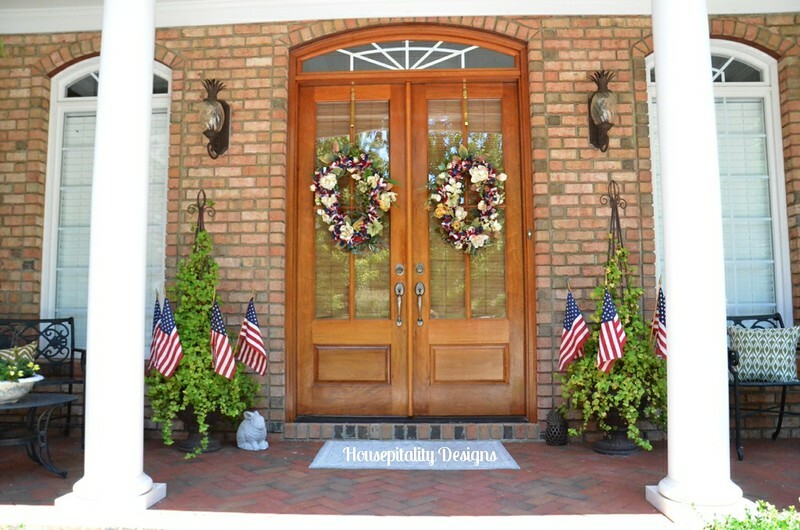 Thank you Holly for giving me my inspiration for my summer door wreaths…. ……I love your many creative projects! And you can see many of Holly’s projects at Down to Earth Style. 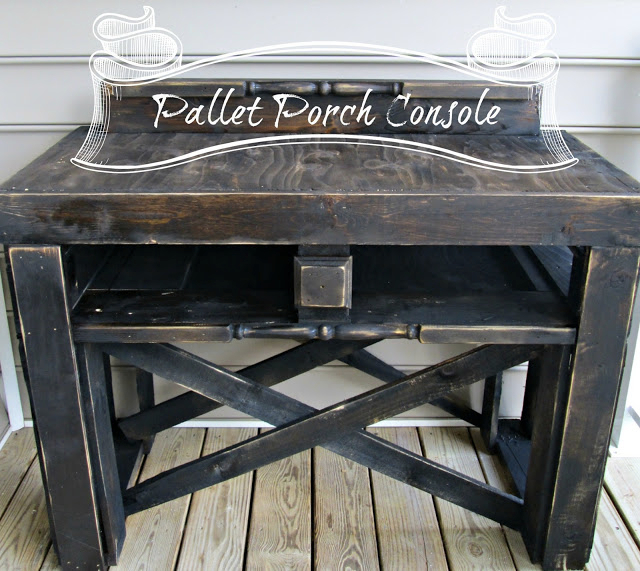 Like this awesome console she made from pallets!! …..and my passion for the symbol of Hospitality!.. Very pretty and I’m sure it is festive and colorful from the street. Hope you survived the storms last night ok. Have a great weekend! So pretty, Shirley! I love this idea! Your wreaths are so festive! I also love your flags! The porch and the wreaths are absolutely beautiful, such talent! 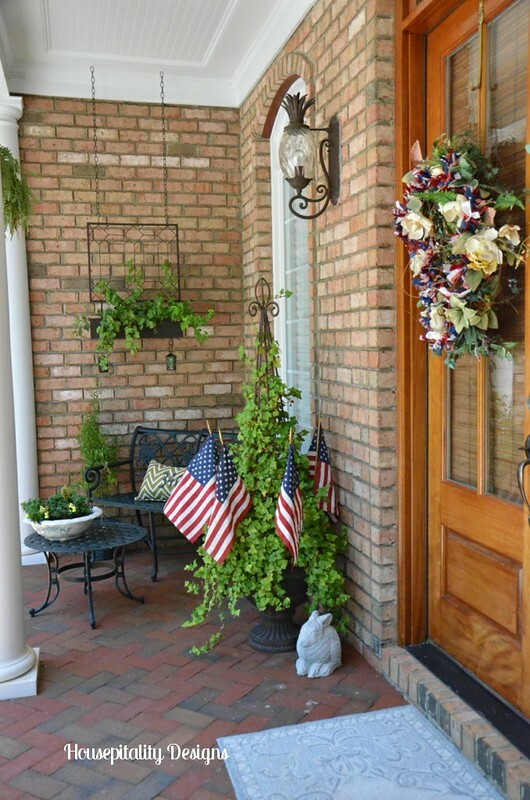 I love the front porch of this home, those double doors & the window above, the brick pavers, and the topiaries. I think I will hop over to her sight and see what else she has. 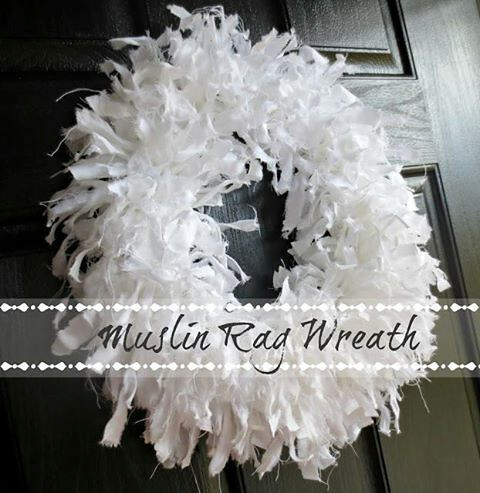 what a fun idea for the wreaths. the tied fabric is so clever! Shirley I love your wreaths, so pretty! Your front porch is great. I follow Holly at Down to Earth Style, I enjoy her blog. I thought that pallet table came out so good. Cynthia’s recent post…Say It Isn’t So!!!!!!! And now you are all ready for July 4th and have done it so easily. I wish there were more places here to run pick up things but if TJ Maxx or WalMart doesn’t have it, I’m pretty much out of luck! 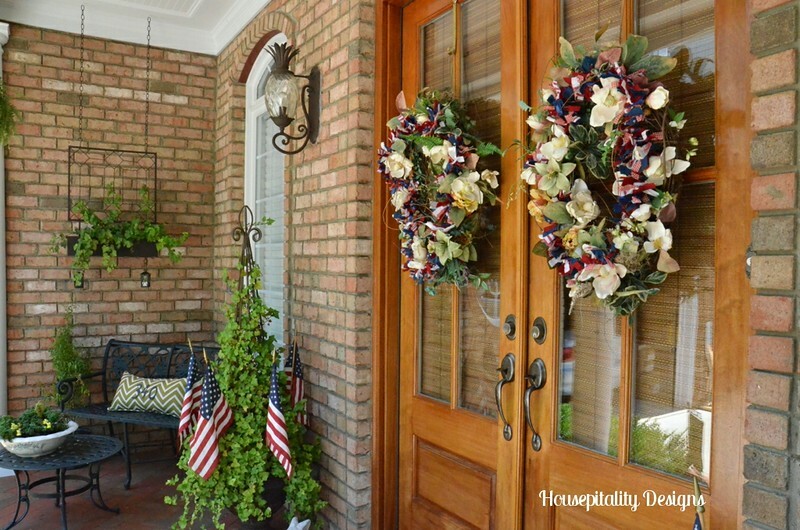 I love the additions to your wreath and what a clever addition to your planters. 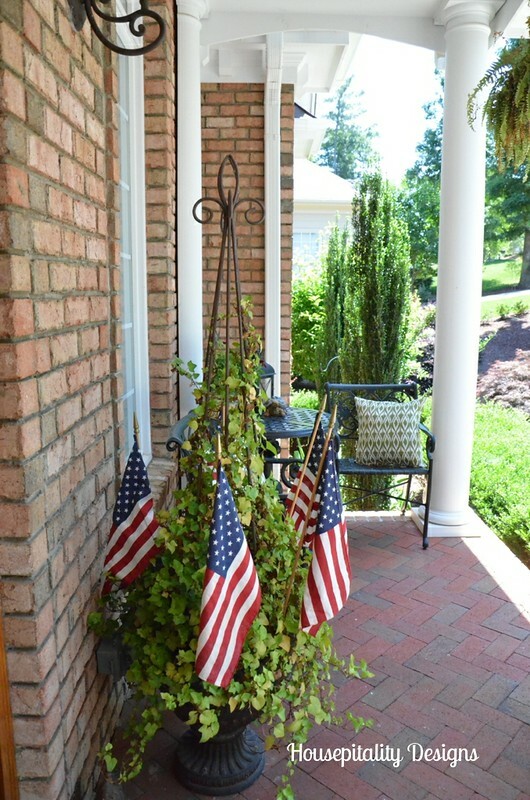 I’m going to grab some flags right now and copy that on my front porch. 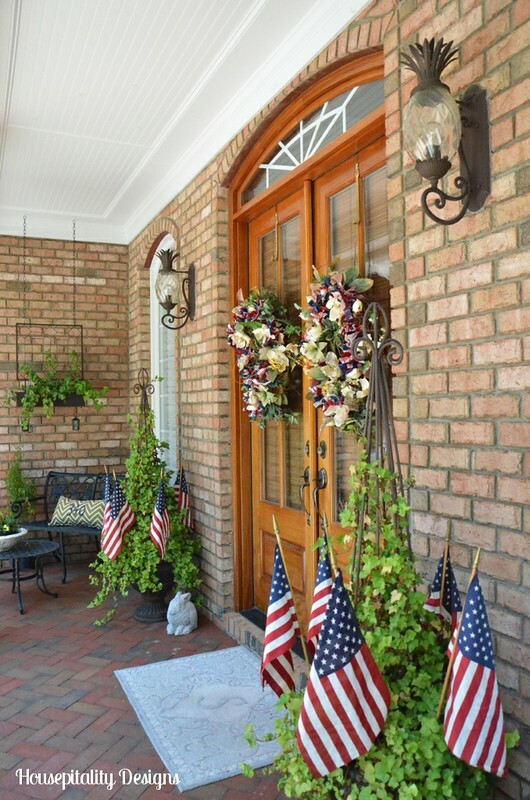 Shirley I love your wreath and flags! Funny because I just added a few things to my spring wreath as well, Some little faux succulents and sweet peas! Karen Albert’s recent post…Artist Teresa Hatfield of Splendid Sass and a Giveaway! OMGoodness friend! 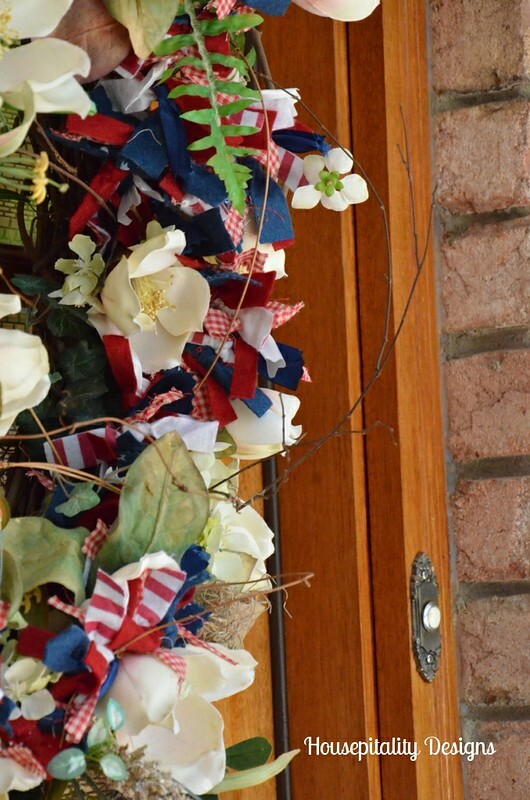 Thanks for the shout out and I LOVE the summery garland in your wreath! ~ I love your whole porch, actually. Amazing front double doors! Thank you…Thank you!!!! 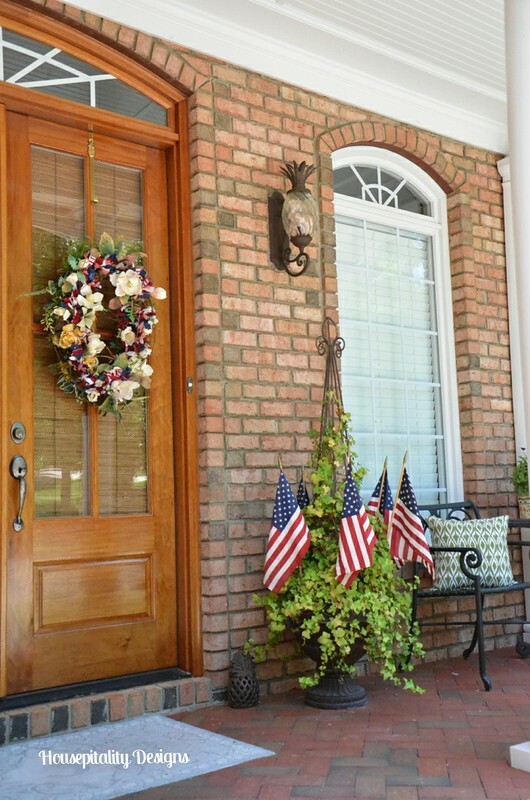 Your porch looks just beautiful Shirley and oh my your wreaths are gorgeous! kirby’s recent post…Feature Friday with paint! 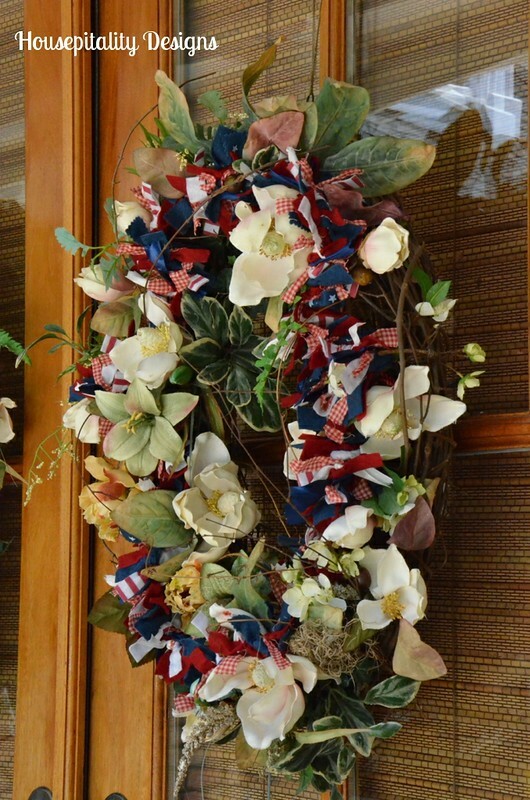 Shirley, I love what you did with the wreaths, instant style. This was a great feature. 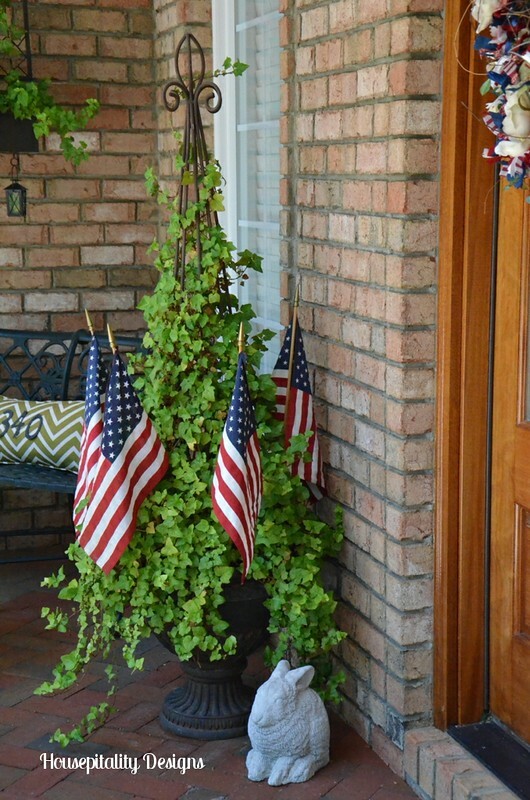 Love the flags in the planters, your ivy is really looking good. 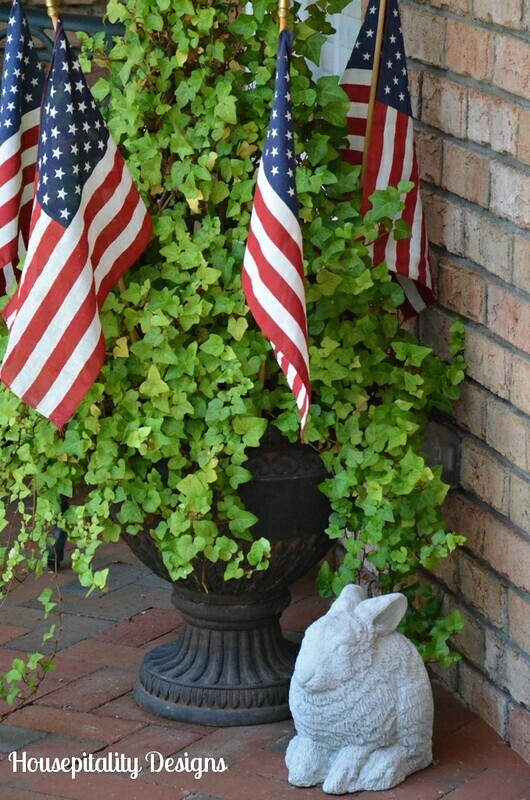 What a fun and patriotic addition to your wreath Shirley! It will be Independence Day before I’m ready! Oh my such a vision of beautiful on your front porch! Love what you did with the wreath too Shirley, just beautiful! Your porch is soooo inviting, Shirley. I saw the garlands at Michaels too – even took a pic with my phone – but unimaginative me couldn’t think of a thing to do with them. I just love the way you used them! Your porch looks so pretty. 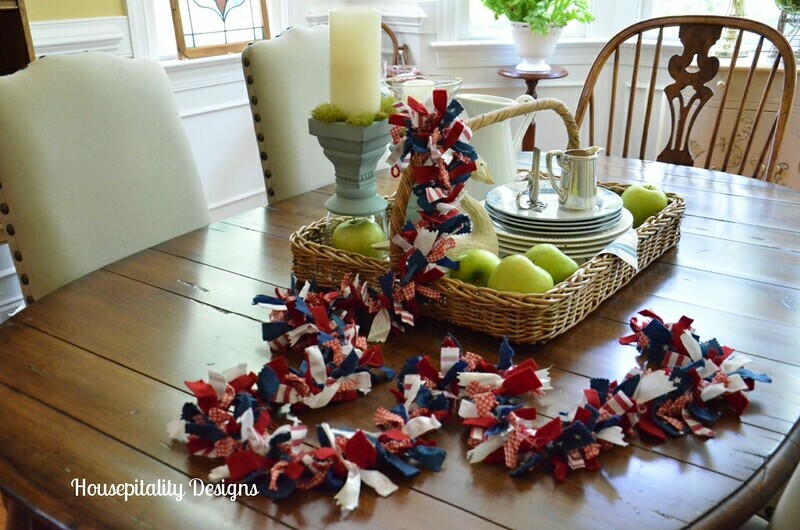 Love the wreath,that was a great idea to weave the garland through it.